State of Decay's zombie-infested survivalist playground will be opening its doors to PC players in a matter of hours. Surprise! 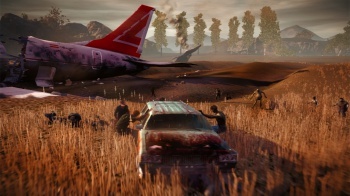 PC gamers rejoiced when Undead Labs announced that the formerly Xbox 360-exclusive zombie sandbox State of Decay would migrate to Steam sometime this year. Things have been pretty quiet since then, until the studio mentioned today that the game will be arriving on Steam soon - as in, tomorrow. Players will be able to dive into the open-world survival game via Steam Early Access, but this is very much early access - the PC version isn't quite complete yet, lacking some little features like keyboard and mouse controls. If you've got an Xbox 360 controller or equivalent gamepad handy, you can use it to do your zed-slaying in the meantime. Undead Labs wants to make it clear that the definitive PC version is yet to come, and the build being released tomorrow is probably riddled with bugs, but it's presentable enough that fans can play it at their own risk. "This process is not for everyone," the studio's blog states. "Casual players, the easily frustrated, and the short of time should NOT get the Early Access version. Hey, I am all three of those things, y'all. Those are not criticisms. It's just that we want everyone to have the experience that best suits their needs. You all deserve the best, so if you're not into giving feedback, just wait a few months and play the final version after we make it great." Those who don't mind their games rough can find State of Decay available on Steam tomorrow for $20, which will include a free upgrade to the full version when it launches later this year.